To correspond with Elder Merrill you can email him at tanner.merrill@myldsmail.net he may not be able to email you back but he can write to you and he loves the letters. thanks for the great photos, it looks you guys had some good bonding time. I'll tell you, the great enormity of time that you took to spend with me during my early years was more valuable that you or I can ever measure. To this day I look back to that, and the things I learned and the love and support I felt from you and Mom during those times shaped my choices and decisions and has made me who I am. Again, I could not describe what all that time still means to me. Every minute you take to spend with Sydnee or Evan will be an invaluable investment in their future righteousness and eventual salvation, it has had a greater effect on me and my life than any other force or influence save only the Atonement. Thanks for that, my children and theirs will benefit from your worthy and noble fatherhood. It does indeed feel like a clean slate, and its an odd feeling to host. There are very few times in your life when you can anticipate with any degree of accuracy a major life change that is about to take place in your life. It feels like something you cannot fully prepare for, which you of course cannot. At the same time, in my case, I know what I am going home to. I know in whom I trust and I know what I have to do. Nevertheless the Lord does not command in all things and many choices will be left up to me. That being said, I have been promised guidance, careful guidance from the Savior through the sojourn of my life, and so the uncertainty is swallowed up in the comfort of an eternal perspective. I'm not worried, perhaps a bit anxious. Apprehensive but not hesitant. The day of my mission is indeed soon to end. I too love the last corner of that fourth and final lap. I vividly remember dozens of times at the PG Jr high school track, coming around that corner, having only one or two boys in front of me, and entering into the final sprint. My body tells me I need to rest, that I'm almost done. Adrenaline tells me otherwise, and I become motivated by the finish line. I always was an endurance athlete. Its better, I think. Nothing good in life is a sprint. Alinune is good, he seems well and faithful as ever. I'm positive for his future. Sabrina is doing well, progressing indeed. Turns out, this is my last week to find a new investigator to baptize before my mission here ends. I will have three weeks to teach, and baptize. I'll work on Sabrina during that time, it would be nice to baptize her before I go. She is probably 26, she bore her testimony last week. Evan has 5 wisdom teeth? I didn't even know that was possible. haha I like the wise joke. JOKE. Nah he's a good kid it will be interesting to see some videos of his experience, if you take them. No coincidence it’s on Friday the 13th eh? Elder Martin and I get on perfectly. He's a good humble missionary, good desires, obedient, easy to be around. He's confident enough to teach and find but still desire to learn and change what he can, great way to finish things up if you ask me. He likes football and America and we have enough in common. He is also President Monsons great nephew. No big deal. Indeed another week has gone by, I'm somewhere near 95 weeks in the field now. Each one feels shorter, but I grow faster and faster as they tick by. I feel stronger than ever. I feel stronger in resisting temptation, fuller with light (DC 88somewhere), bolder in testimony, higher than ever yet lower than ever. It is a great place to be in these last few weeks. Convert baptisms this week for the stake was one. Alinune was baptized last Saturday and confirmed in sacrament meeting yesterday. It was a smoothly run baptism, mostly - I forgot extra G's or even a white shirt so I last-minute improvised and used a church jumpsuit -, and a decent night overall. I had the privilege of baptizing him, in addition to teaching him all of the lessons. It was a fantastic 6 weeks growing with him and watching the changes and conversion take place. Good guy. Elder Martin is from South Jordan, he knows Brody Strong. He played Football for Bingham, long snapper. He's a good, obedient and hard-working missionary and I love him. He is a great last companion, so I look forward to the next few weeks in working with and alongside him. We are working with a girl named Sabrina, she has a testimony and desires to join the church. Her mom is RC, lives abroad, and hesitates letting her daughter get baptized. If you could pray for her and her situation, that would be great. Thanks, we fasted for her this week. Wow, here goes the last transfer of my mission. Interesting point to be at, but I feel good, really good. Elder Zander is being transferred to Belfast Zone, and I'll be getting Elder Martin. I hear he's new, just finished training so he'll be about 3 months out. Should be good, I'm getting along fine with the ward and the missionaries, it is all going fairly well. Glasgow has a very bad reputation, most speak of it poorly but it really isn't too bad. It has some dangerous places, it can be dirty and very poor as well but it has character and the people here are generally proud to be from here. Glasgow has its dodgy bits, but also some real beautiful buildings and history. We spend about half our time in the poor bits, and the other half in quite posh and well off areas. I like it though. We will be baptizing Alinune this weekend. He is from Malawi, he is 30 and studies Environmental Statistics. Cool guy, quiet but real funny once I got to know him. He has great faith and real intent and is prepared for his baptism. Glad to hear you both got up, it is always a rewarding thing to bear our testimonies. I do it whenever I can here. Next Sunday is the last fast Sunday away from home, crazy to think about. So there you are, things are better than expected. They are on the up, and I'm happy. Looking forward to work with Elder Martin, President told me he was a good, willing hard worker, which I'm excited for. Last transfer, here we go. Not much else to report, some good lessons and more focus on developing relationships with members. It’s cold but we are staying warm and dry, mostly, and happy. I'll send a couple photos. Temple cleaning assignment sounds interesting have fun with that. I think I've eaten at that Italian place by the way, not sure if it’s new. Reading the words Cafe Rio...... mmm. I love Mexican food, none of that food here. Just Indian and Chinese. Thanks for everything, I love you. Moves call next Sunday, should be good. I'll be staying and E Zander will probably be going. PS. Sharing a sacrament service with Matthew Wager will be a pleasure, I prefer going 2nd so that’s perfect. Oh shoot, I've got to start figuring out what I'm going to say. Flip. Elder Zander is European. We actually get along quite well. He likes soccer and football. He's a software guy, a video game sort of person. He has a funny sense of humor. He has a respectable work ethic as well. He is 5 foot 10 and thin as a rail. Good kid. Interesting week, I did my second baptismal interview for ..... I was unable to attend his baptism as Elder Zander was sick with stomach issues all day. All day in the flat, I read a lot. He's better now so were out and about. It was the first time I've missed church in well over two years. The weather is trying to kill us. Winds over 100 mph and rain, it soaks into our flat which is on the third floor and we constantly change the towels the soak it up, circulating the dry ones for wet. This is Scotland, and it’s never going to let me forget it. I do love this country, I don't want to live here but a part of me will always be here, of course. So many friends and places I can call home dot this Island. I'm grateful for these last few months especially. There has been something especially humbling and edifying about them. The rate at which I change and grow has increased as my mission days tick away. No sign of slowing down, but the cliff ahead clearly in sight. I love you mom, have a great week and enjoy dinner with the Oldham’s and Trewartha’s and give them all a hello from Glasgow. The Kilt tartan is Grey Highlander, its £230. Brand new and top quality. Merry Christmas, I was wondering when/ if that would get there. I prayed hard that it would safely travel home, as I spent nearly a year on it. I figured it would be the most valuable of gifts to send to you, and its made my week to hear what you think of it. I hope that if anything, it will portray my own personal conversion and growth to you, and how grateful I am to you as a family. I put in those things I thought would be most applicable to our family collectively, and of course in some instances, pondered over words to write to you individually. It was a great blessing to spend all time with you all in mind, stewing over the verses of scripture considering all the needs of each member of our family. It was a great time and now that I know you have it, it was all worth it. I'm happy to know that you can see and rejoice in my testimony and conversion. I rejoice in your rejoicing! I have been converted, and I do know. Its interesting when you go back and think about your life as you would if you were writing a short summary or autobiography. Its great to reflect on the things I know about your life and who you are. You certainly never wasted time, nor gave up, you were in it for the long haul and I'm so grateful to see that you are successful. You are, as a father, as an employer, as a member of Christ's church and a son in God's family, successful. Like Nephi of old I know of my father's goodness and his calling and have received a confirming witness to know the things that you know. My mission slowly comes to a close, the close of this priceless chapter of my life. Its crazy, can you remember these last few months? Craziness. But at the same time I'm content, it feels right that my full time service is nearly done, and it feels right that I will go home soon. ps I found a kilt. It certainly was great to see you all. The package was wonderful and I will be reaping the goodies therein for weeks to come. Everyone was jealous of the SOBE drinks ha-ha they are gold. Great to see you and to speak with the family this week. It’s a great blessing to have a wonderful righteous family of Ephraimites. I look forward to spending time with all of you greatly, occasionally I think of what it will be like to again hike, golf, play tennis and watch political TV, oh and eat dinner with all of you again. Good times, the things I remember. I express gratitude daily to God for you and your great example, you’re a great Father and I am motivated in many of the things I do to respect our family name and to make you proud. It’s been an interesting week here in Glasgow, indeed it’s a big city and occasionally quite dodgy. It’s been getting colder and today is especially foggy, but we were still out all day working hard. Late last night, after 9pm in fact, we turned the corner and watched the last bus of the night drive away. We were a good ways from home and in Drumchapel, which is a very dodgy part of town. It was obviously dark and pretty cold, and I was pretty ticked that we missed our bus, especially because we got within about 100 yards of it before it drove away. We got just close enough to see that it was indeed our bus and that we had missed it. We began walking home, which at full speed took us about a half hour. Not too bad, but annoying, really annoying. Thanks for the kilt money; I'm excited to look around for some deals which I'm sure are plentiful as it is just post-Christmas. We are spending New Year’s Day with Pierre, a recent convert here. He's the guy whose home I skyped from on Christmas. He's the epitome of a good guy. The golf clubs got me way excited ha-ha not much has made me trunky but seeing the clubs made me excited to be home to use them. Glad to hear the Keoghs contacted you, they were so good to us and are really good friends. I believe there is a picture of me on their fridge now as well so that’s funny. Sister Keogh will have us over for dinner when we visit Dundee this coming year, she would love that. She always reminded me of mom in a lot of ways. My name is Becky and I'm a member in Dundee. Dad is the Bishop in our ward and we got to know Elder Merrill really well while he was serving in Liff. I hope you don't mind me emailing you but we wanted to send you some pictures we took with Elder Merrill just before he left Dundee. 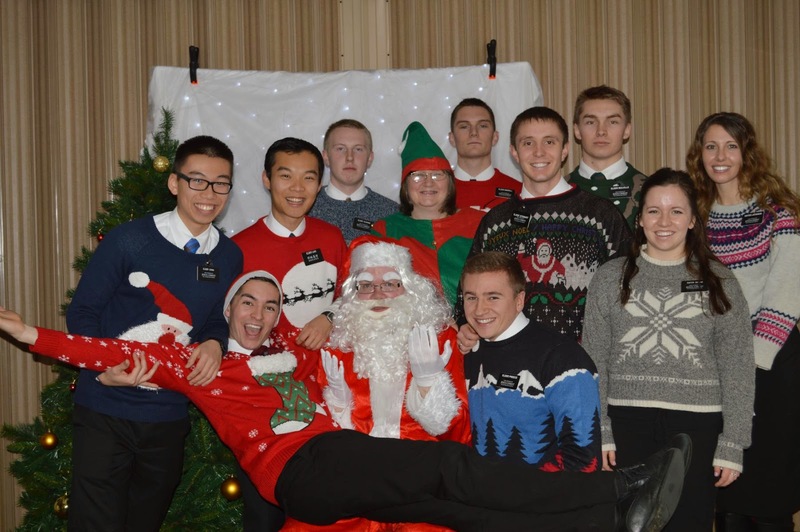 The other two pictures are from the recent Christmas Spectacular show we did in our stake that the missionaries took part in. We also wanted to let you know how much we enjoyed having your son serve in our ward and how much we enjoyed getting to know him. We can honestly say he is one of the best missionaries we have had serve in our ward for a long time. He may have only served in our ward for 2 transfers but he had a big impact on so many of the members. He has been a great example to us all and we now count him as a great friend. He really is a credit to you. Hope this email finds you all well and that you have had a great Christmas. This letter is to the whole family because our emailing time today is very limited, due to the fact that we will be skyping this Christmas day. Looking forward to seeing you all and speaking with you for one final time before we meet again. What a good question Bro Renstrom asked, your email was good today Dad. Especially the story from Grandpa Champion, what a guy, what a story. There is no denying it; this church is Gods kingdom on earth. So much great news! Thanks for the updates on everything. It’s great to hear about family and to know everyone still remembers me. The pictures of the family gatherings were great reminders of the many blessings we enjoy back home, can't wait to see everyone again. Spiced Walnuts, oooo I love those things, I've learned a lot of things and become a bit wiser but I must admit I would probably still eat those nuts until they made me sick. So far Glasgow is interesting. My companion, Elder Zander, and I get along fine. The Elders in my district are doing very well. I'm a DL over a team of English Elders and Sisters, and two Chinatown Chinese speaking Elder teams. The Chinese teams baptize darn near weekly. Hopefully I should skype around 10am your time but be ready for any time, be watchful of your emails in case I need to make changes. Can't wait to see you. If I had three minutes left to live, I too would bear my own testimony of the savior. And do some speedy repenting. God knows I need it. Love you family. Merry Christmas, see you soon. Glad to hear that you saw the Choir Concert. I must say if I knew you guys would be watching I would have waved at the camera or something. Must have been facebook or something, Becky is always putting stuff from her videos online. I hope you enjoyed it, it took lots of work and it was well applauded. How much of it did you see? I had a sore throat all day, but it turned out fine. Okay, moves call. I received a new assignment from President Brown to serve as a DL in Clydebank in the City of Glasgow. I'll be serving with a German, Elder Zander, whom I've met before. I will spend my last few months in Glasgow and finish my mission there. Should be good, I know several people there and everyone I talk to who has been there has loved it. Spending Christmas there was very unexpected but I just pray that I can carry out the assignment that the Lord expects of me successfully. Thanks for your prayers and support, have a wonderful week and know that I love you. I should get that package this next week, but I look forward to seeing you guys Christmas most of all. It snowed yesterday, which was very cool. I haven't seen it snow like that since the day I left the MTC those many moons ago. It was beautiful, and it’s getting very very cold. I love that speech, in my mind it’s probably the most profound non-prophetic utterance recorded yet. I also think of the words of Nephi I believe, the one in Heleman, who wished he had been born in the time of Nephi of old, because he viewed the people in that day as quick to believe and do the word of God. Although his perceptions were a bit skewed, his next words are the important bit, "but I am consigned to my day, to preach the gospel to this people which are quick to do iniquity and slow to hear the word of God" or something like that. The word consigned means, to have been assigned to or given trust over. Indeed we in our day are also consigned, or given trust over, our day. I rejoice in this truth, although it’s quite hard sometimes. I would rather it be this way than to have it easy. Glad to hear that you got to see me sing, hope we sounded alright. The actual performance in Stake Conference was the best one we ever did. Stake conference was very interesting as well. I will tell you why. So the missionaries generally were not to attend the Saturday night session, but we had an investigator who wanted to attend it, so we organized it and went to meet him there. We waited for about ten minutes after the meeting and he never showed up, so we were about to leave, when Elder Herbertson (of the seventy) walked up to us and shook our hands. 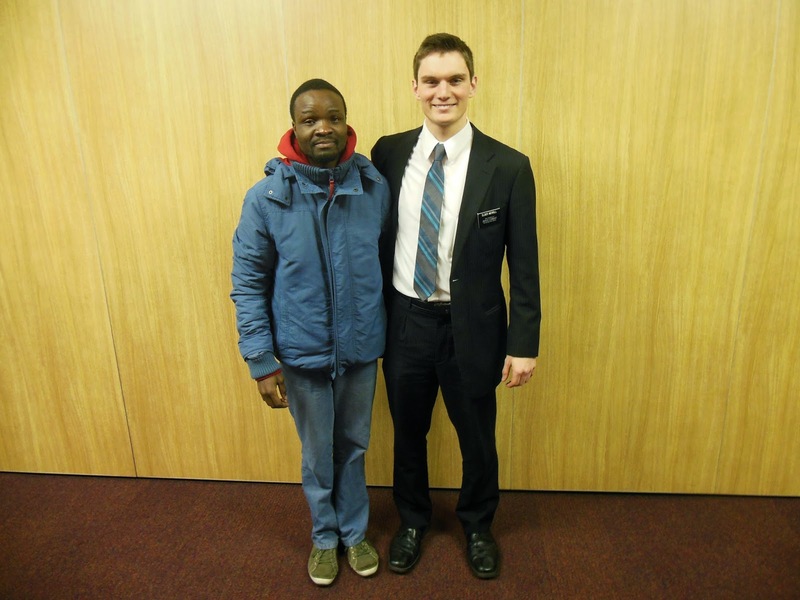 I had met him before but he obviously didn't recognize me, he asked us where all the missionaries were. We told him the situation, and he said it was hoshposh and told us to sit in on the conference. So we did, of course. It turned out to be great, the conference was fantastic and many people, who I know, from Perth and Liff, gave great talks. Also, during Elder Herbertsons talk, which was great as well (I've always enjoyed his presentations he's a good and humble guy) he made reference to us, the missionaries many times. He even asked us to stand at one point while talking about hastening the work. I was glad there were at least some missionaries there and afterwards lots of members from our ward came up to us proud that we had "represented well". Elder Taxiera from the seventy then spoke, had us stand again and made many references to the missionaries, whose only emissaries that day was my companion and I. It was interesting and inspiring. The Sunday session went much the same, however this time all the missionaries came. President Brown was also present. It was a great time, we sang and participated and the new Stake Presidency was called. Lots of tears and thank-yous'. Glad to see that mom and syd had some fun this week, and that you’re all happy. Looking forward to the Christmas package yes moves in next week so we will see what happens. There really isn't a way to predict what's going to happen, so I'm not sure what to think. I would like to stay for the winter but I'm not letting my desires get me down in case the Lord has another area in mind. Anything will do. I'll go wherever. Have a great week, Merry Christmas and I love you! It’s been a great week, full of thanksgiving. First of all, the bishop’s family fed us on Thursday, giving us a full Thanksgiving meal just like at home. The next day we were fed by Mike, a less active member, who fed us loads of mince burger and chips, then Saturday night we had the ward thanksgiving and Scottish dance activity, and ate loads there as well. Tonight and every night this week besides Saturday we are getting fed by members, I'm pretty stuffed full of good food and I think it won’t matter how hard I try I will likely put on some weight this season. The members of Liff ward are certainly taking good care of us, we are also seeing an increased desire in them to do missionary work and invite their friends. The potential energy is high, we think we just need an initial success, a couple baptisms, to get the momentum going and send the whole thing off. We are teaching the husband of a member here, his name is …. and he's not religious at all but is always up for a good challenge. As part of our lesson plan, we decided to challenge him to a test of faith. He works at the city market 4 days a week, one of those days being Sundays, and this is his main excuse for not coming to church. He says Sunday is his best day for profit, and it would put him way behind if he missed it. Our challenge was for him to go to church on Sunday, and not attend the market, with the promised that he would make more money that week by attending church. He was passive about accepting the challenge but told us to keep our eyes peeled on Sunday. Unfortunately, he didn't show up. Nevertheless, it was a great faith building experience and we felt the spirit guide us through trying to plan according to his needs. We have a had a week of much finding and seeking new friends to teach, and have managed two new investigators. Also we visited a couple, David and Kayli, who was that couple we stopped on the street after missing our bus stop. David was the one we thought we were going to teach, but after a few minutes of speaking with them, it was clear that Kayli was the one prepared to receive our message. Not long after beginning our discussion, and after testifying that they could understand Gods plan and know that this was his true church through the Holy Spirit, Kayli asked, "what do I need to do so that I can know that". GOLDEN question right there, we have an appointment with them on Friday I believe, looking forward to it. Plus we may go golfing with David soon. We were pulled into a surprise conference on Friday to implement the "He is the Gift" initiative. Go to Christmas.mormon.org if you've not heard mention of it yet. We are using cards, the website and other resources to integrate the "true meaning of Christmas" into our finding and teaching. I'm pretty cool with it, seeing as how I've been very turned off at how the world celebrates Christmas; to me it’s the worldliest time of the year, where Christ is far from the hearts of men. So this is perfect. Email me at premierpaintinginc@yahoo.com and I will forward it onto you.